Suzuki Marine DF15A and DF20A are all-new, twin-cylinder outboards boasting an Electronic Fuel Injection that does not require a battery. That means the motors can be rope-started (Electric starting is optional). Curiously, the Suzuki EFI requires two pulls of the rope in order to energize the fuel injectors and then start the engine. More specifically, the crankshaft has to rotate through 720 degrees (two full turns of the crank) in order for the magneto to generate enough zap to energize the ignition, the fuel pump, and to index ignition timing to the crankshaft's Top Dead Center. Sometimes it fires on the first pull of the rope, if not one, then always the second. Hot or cold weather, no problem. You should know about the decompression function that reduces the effort required to pull the starter rope by 20 percent. To engage decompression lightly tug the rope a few times before pulling hard. 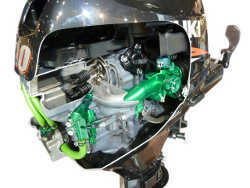 For these DF15A and DF20A outboard motors Suzuki engineered a new Electronic Fuel Injection system. Component parts include a high-pressure fuel pump, throttle body, vapor separator and injectors. All these component parts were scaled down in size to keep weight low. The strategy worked. 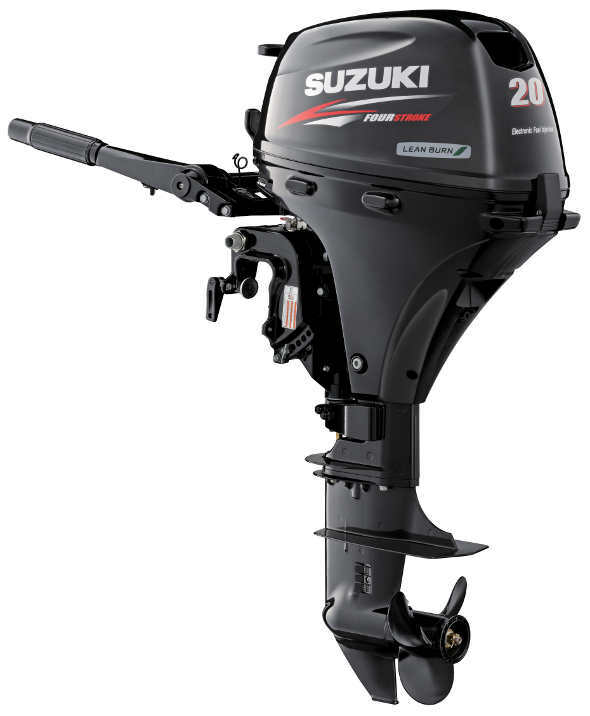 The new Suzuki weighs just 97 pounds while competing outboards tip the scales at 104 to 115 pounds. In the control module's firmware resides a subroutine called Lean Burn Fuel Control. Naturally it follows its job is to lean the air/fuel mixture at cruising speeds, enhancing fuel economy by as much as 14-percent. Lean Burn adjusts the air/fuel mixture to as lean as 18 to one, as compared to the accepted norm of the stoichiometric air-fuel ratio of 14.6 to 1. So why not lean burn all the way up the torque curve to Wide Open Throttle? The answer is Otto engines can tolerate lean mixtures at lighter loads, but at full throttle the reciprocating mass needs a refreshing, rich splash of raw fuel on the piston domes to keep them from melting into puddles of molten aluminum. Besides precise control of the fuel mixture another benefit of EFI is that the fuel is always pressurized and not exposed to moist ambient air. That means no water in the fuel. Also, unlike carbureted outboard motors, the sequestered fuel is less likely to oxidize, to turn sour because the lighter gasoline molecules have evaporated leaving behind a concentration of gum and varnish.